In a Nepalese grocery store in Kowloon, James Lung Wai-man, a typical local Chinese picks through the merchandise and introduces each item.” This is Nepalese tobacco which can be chewed directly and need not be lit,” he proclaims. The Nepalese shopkeeper looks on and smiles as if an old friend has come to his home and helps himself to drinks. Lung is a familiar figure to shopkeepers and owners of Indian restaurants, Nepalese hair salons and an ethnic newspaper office in the Jordan district- one of the several districts in Hong Kong with many ethic minorities. For them, Lung is not just someone to consult when they need help, but also a friend who frequently drops by the visit. Lung wants to help Hong Kong’s ethnic minorities through different channels, including helping them to gain political influence. He believes the best way to do that is not to aid them directly, but to empower them to voice their own needs. With this in mind, he co-founded the Southern Democratic Alliance in 2004. The alliance, of which Lung is currently the chair, is a political organization with 600 members mostly drawn from ethnic minorities. Lung decided the most effective way for ethnic minorities to speak up in Hong Kong was to enter the Legislative Council. So he decided to run in the 2008 election with Bantawa Sukra, a Nepalese who is the spiritual leader of a pan-religious group called the Heavenly Path. Compared to the election campaigns of political parties which have abundant funds, Lung’s election campaign only have a budget of hk$90,000. “I was the only candidate who had no banners on the street. It sounds ridiculous but I just couldn’t afford it,” he recalled. Perhaps due to the lack of publicity, Lung got just 591 votes, one of the lowest tallies in the Kowloon West constituency. Those votes came mainly from ethic minority voters and probably, from members of the alliance. “I already knew I was not going to win at that time but the HK$90,000 was worthwhile for the publicity it bought,” laughed Lung, who poured most of his savings into the doomed campaign. Referring to the publicity, he said he had gained abundant media coverage in newspapers, radio programmes and television shows during the election period. The video clips of his debates with other candidates are still on YouTube, and have sparked discussions. To Lung, all these have all helped raise public awareness of ethnic minorities. Lung’s rivals have criticised him for taking the limelight from the ethnic minorities he said he wants to help. They said he should have stayed in the background, helping minority candidates with strategy, rather than running himself. But Lung insists he only stood for election in order to help ethnic minorities to get into the LegCo. “The point is that they cannot debate with other candidates fluently in Cantonese. I can help them express their ideas when I am also running the election,” he said. The failure of 2008 does not mean that Lung is a poor strategist. In the 2004 LegCo polls, Lung helped Ronald Kung Yiu-fai, a little-known accountant and political novice to run for the Accounting functional constituency seat. Although Kung did not win, the 1815 votes he got put him in third place in a race with nine contestants. Kung is not the only political newcomer that Lung has helped. Lung has been an election manager of the candidates in several District Council elections. Apart from helping candidates in their election bids, he also worked as an assistant to District Councillor Ip Shu-on in 1999. It was his experiences during the time spent as a councillor’s assistant that made Lung determined to help ethnic minorities. Lung recalls that one time, several Indian residents went to the councillor’s office to apply for public housing. “I gave them several application forms. But they came back later with blank forms. Only then did I discover that they could not read Chinese or English,” Lung Said. He realised that some racial minorities could not even identify their needs and the problems they were facing. They were neglected by society and discriminated against in silence. Lung said the problems faced by ethnic minorities cannot be solved solely by expanding their political influence. Instead, he believes several cultural myths held by Hong Kong people need to be knocked down. 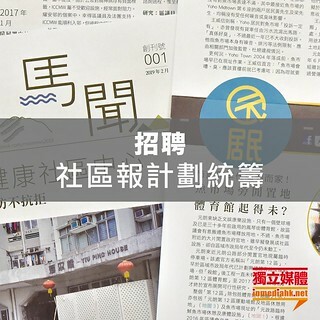 “People who are not Han nationality are not considered as owners of Hong Kong people. Locals always think that no one will starve to death in Hong Kong, but it is not the case. They always think ethnic minorities are lazy and not smart,” explained Lung. Asked whether he thought that ethnic minorities were lazy, Lung said “I can only say that they are carefree, not as fast as locals.” He suggested Nepalese just have a different concept of time to hurried Hong Kongers, ”When I visited Katmandu (the capital of Nepal), I only found a clock three days after arrival,” he said. To dispel the cultural myths, Lung tries to work as a “cultural exchanger”. He led Varsity to a Nepalese grocery store, introducing Nepalese tobacco and spices; then brought Varsity to an Indian restaurant, to watch the making of traditional Indian pancakes. Lung recorded the whole process with a digital camera that he carries with him every day. The next day, a video clip of the visit was posted on Lung’s blog. Utilising election coverage in mainstream media for publicity is not the only tactic he knows. Lung’s blog contains many video clips, pictures and interviews with celebrities. He has also hosted radio programmes for online radio channels such as Uonlive and Onairpower. Lung has made good use of the Internet, which can be more powerful that mainstream media these days. But this has also drawn criticism. “I wrote my own introduction on Wikipedia (the popular free online encyclopaedia). The entry was then closed because it was reported for self-promoting. But I am not! I am just trying to let more people know about me,” he said. Lung is concerned about his exposure, but he seldom cares about his appearance. He always dresses casually and carries an old rucksack. “I avoid wearing formal suits; otherwise, they (the ethnic minority residents) wouldn’t be able to recognise me!” he chuckled as he wiped the sweat the sweat off his face. He dose not care for social status either. Lung has a Higher Diploma in Social Work from the Hong Kong Polytechnic University in 2007, so he has the necessary qualification to register as a social worker. But he has not done so yet. “I didn’t register because I don’t think social workers should be regarded as high-status professionals such as doctors and lawyers, because people will hardly tell the truth and unveil their real problems in front of social workers,” explained Lung. Instead, he likes to call himself a “community servant” a term he said is his own creation. To make ends meet and to serve the community, Lung works as a part-time substitute junior secondary teacher and a piano tutor in community centres .The daily income of a substitute teacher is about hk$900 and Lung does not work every single day. Despite the unstable income as a freelancer, he does not want to become a full-time employee. “I want more freedom to do what I want rather that caring about money,” he said. Neither does he see being the chairman of Southern Democratic Alliance as long-term employment. Lung has held the post for five years. “Finally and hopefully, I want to pass the position of chairman on to them (racial minorities) so that they can take up their own responsibility to fight for everything themselves,” he said. Ethnic minority issues are the main focus of Lung’s career but his concerns are not limited to them. He is concerns about the democratic development of the mainland China, Hong Kong and Macau as well as the political status of Taiwan. For this political belief, the 35-year-old has to sacrifice many things, including love. “It is difficult for a busy man like me to find a lover,” he laughed.